Spotted this on eBay this month. DOCTOR WHO 1979 '' DESTINY OF THE DALEKS '' TYSSAN ( Tim Barlow ) distressed jacket and belt. the dust was still making its presence known, even though I had gentle shook it for a good few minutes. Tyssan is one of the main characters in the story and is in some of the key moments in the story. 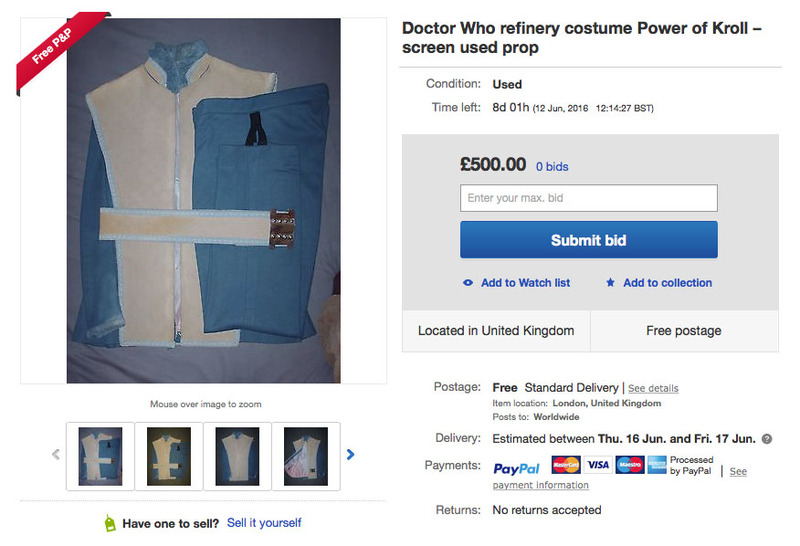 A RARE opportunity to own a screen matched key characters piece of wardrobe, from the Tom Baker era and ad to that from a Dalek story. ......... what more could you want? 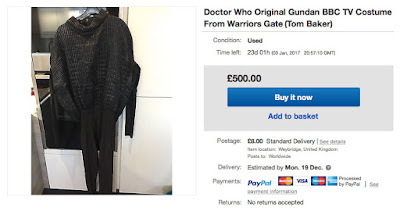 This is an original BBC costume from the classic, Tom Baker, Doctor who serial, "Warriors Gate", originally aired during the 18th season over three episodes from 3 January to 24 January 1981. This is a full Gundan jumpsuit, which sat underneath the armour on each Gundan robot. It is in excellent condition with a foam corrugated type material top and silky black arms and legs. 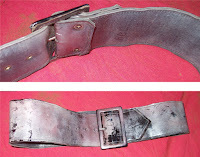 It also comes with a Gundan waist harness, that joins around the waist and through the legs (picture). Written inside the jumpsuit is the name Tony Prior, who is credited as a Gundan robot in the serial. 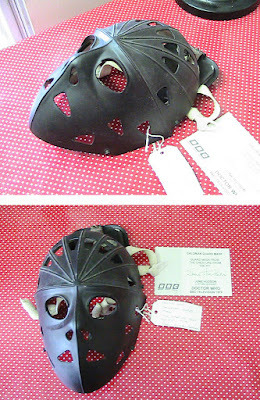 The harness has J.Adams written on the inside. 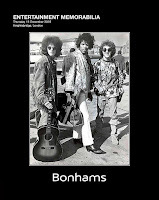 Every six months I eager anticipate the Bonhams Entertainment auctions at Knightsbridge. They often turn up Doctor Who props and especially costumes. 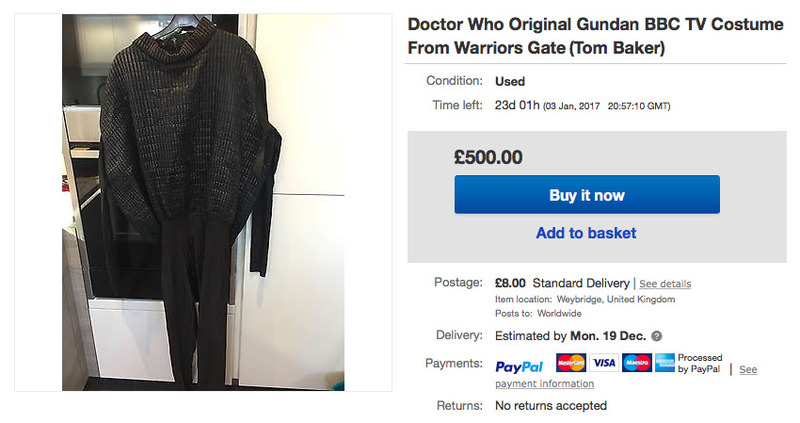 In the past we ’ve seen Tom’s trademark scarf sold, and even one of the velvet frock coats. 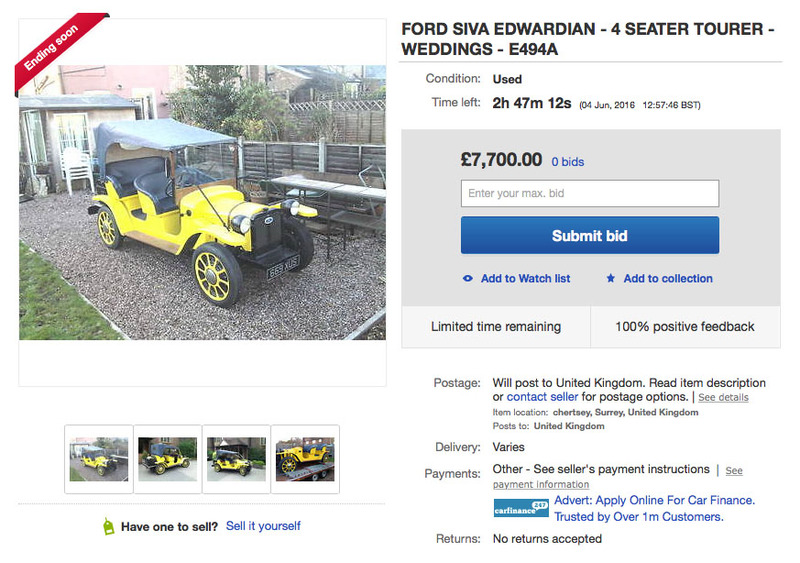 This time around, to say there is very little on offer is an understatement - only one solitary item. 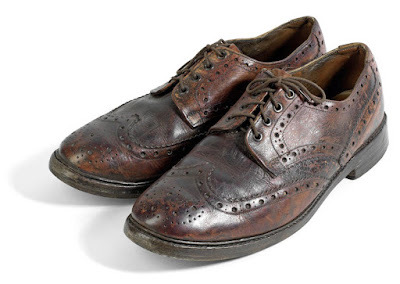 But it is a pair of shoes worn by Tom during his time as The Doctor! Ex-lot 144, 'The Angels Film Costume Auction', 23rd May 2010, Cameo Fine Art Auctioneers. 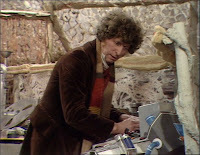 After last week’s grey tweed frock coat, this week I completed work on what chronologically was Tom’s next coat, the brown velvet version which debuted in Face Of Evil! This too was a client-led project, and something I hadn’t done before so again the production time inevitably became quite drawn out. 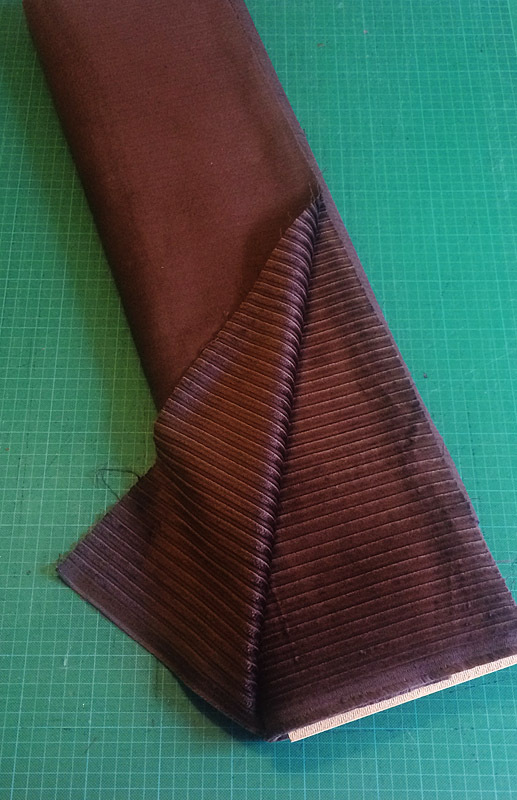 The main challenge was to source a velvet in just the right shade of brown. 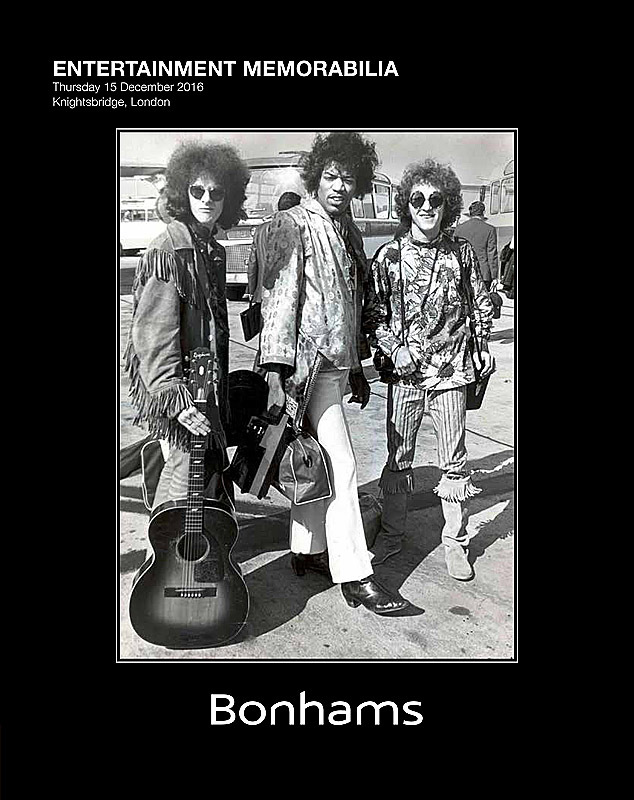 I have a couple of suppliers I go to for velvets. It’s from these that I sourced the velvets for the Sixth Doctor Frock Coat, as well as the collar of my City of Death coat. 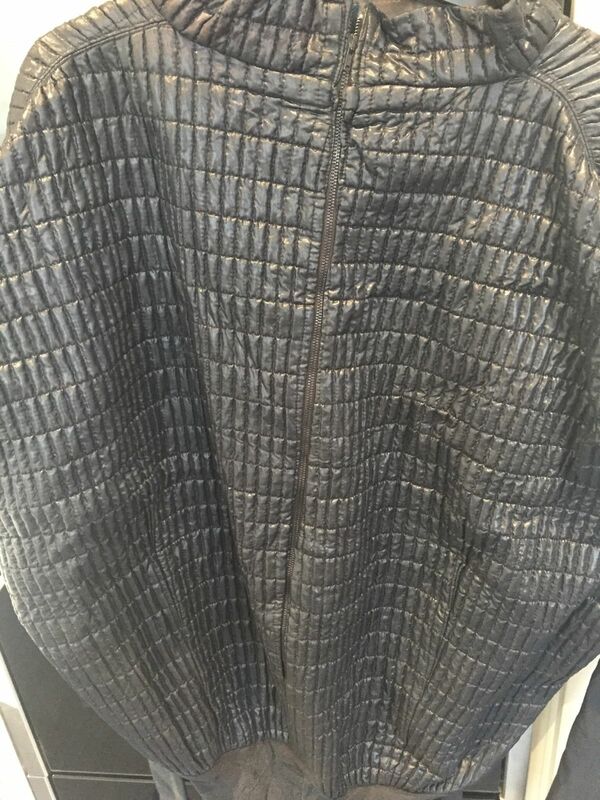 One of my UK based supplier has over 40 colours and up till now hasn’t let me down, but for this particular coat the range of browns they stock just didn’t match the screen-worn shade I was after. Next I looked to a manufacturer I use for corduroy and moleskin who also has a range of velvets, but again their range was too narrow to cover what I was looking for. Next on my list was a stockist in Germany who have a good range, but it’s difficult sometimes to communicate the shade you want and the range of browns they sent still didn’t have what I was looking for. They also were a little on the heavy side, and given the fluid drape I need for the skirt part of the coat, the cloth really wasn’t suitable. This left a final option - the various cloth and fabric shops of London’s Soho. To be honest I don’t like to use Soho for a coats like this, as although you can sometimes find what you want, the stock isn’t repeatable and be a dead-end for future coats. When the Doctor Who costume designers find cloth here, like off-the-peg clothing used on the series, by the time you find where it came from the last of the cloth as gone and can’t be restocked. 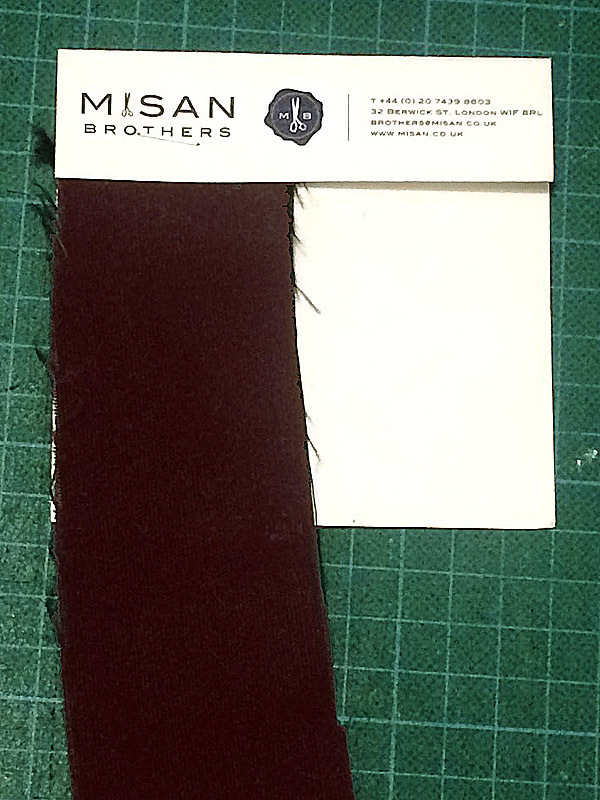 However, I did find a couple of potential fabrics I was happy to show to the client, and sent him swatches. He wasn’t convinced and we went back and forward before agreeing that one of them could work. Sadly though, by the time I got back to the shop my fears had come true - the last of that shade had been sold! Despondent I looked through a couple more shops before heading home and chanced upon a PERFECT match - even better than the first choice I had sent the client. Rather than let it slip through my fingers, I snapped up enough to make the coat, plus a second for myself, which I’ll make at a later date. I conveyed the results of my trip back to the client and put a swatch in the post - but time was now of the essence and I needed to crack on with making the coat in time for his deadline around Halloween. 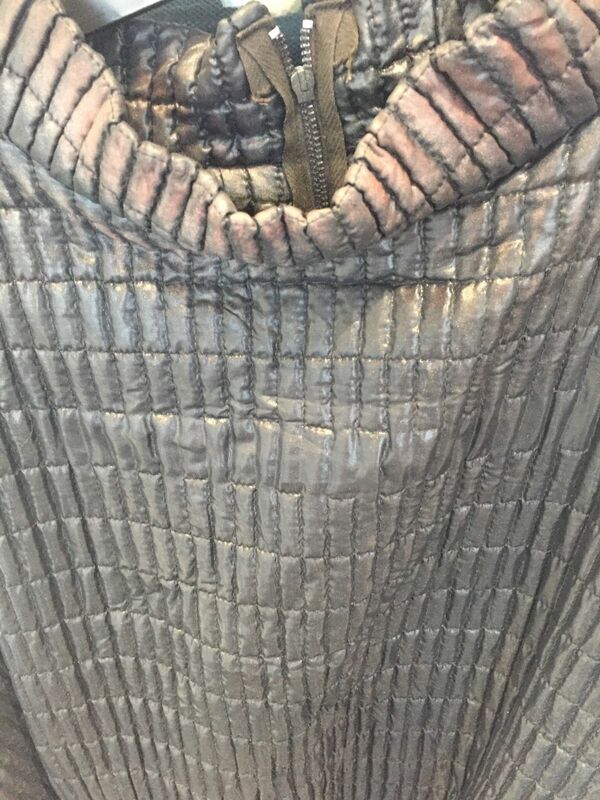 To cut the coat, I used a combination of the Eighth Doctor Night Of The Doctor coat I made, with the grey Android Invasion coat I did recently. 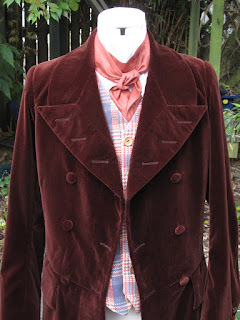 To be frank - having studied photos of the brown velvet frock coat - I don’t much care for it. I feel the original was probably made in a rush and wasn’t best thought out or executed. 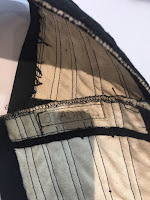 It has a set of waistline level pockets, but the flap are disproportionately large and look to have been hand sewn in place as an after thought. You can see the hand stitching in this screencap (see left). 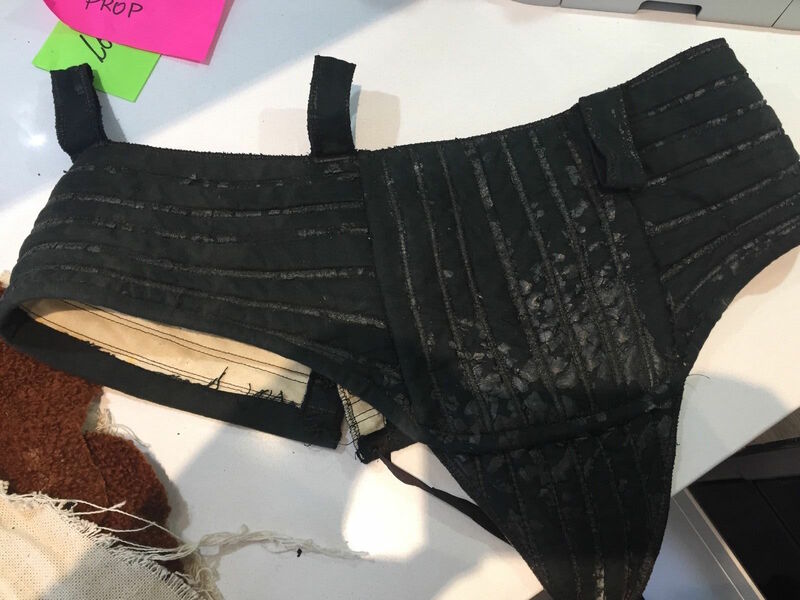 Having discussed this with the client, we agreed to make the flaps large, but just pull back a little from their near comical size, so I used the pattern size of the lower pockets from the City Of Death and Android Invasion coats as a guide. The buttons for this coat are very easy to match as they are simply self-covers buttons. All I had to do was keep hold of some scraps of cloth left over during sewing, and took them along when I had the buttonholes sewn. The guy that does them also makes covered buttons while you wait! 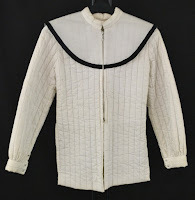 The tailoring on this coat has been deliberately loose and lightweight. 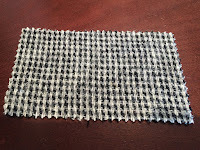 Where I would usually use a horse-hair or calico backing to support the cloth, I have erred on the side of a lighter weight or even a cotton pocketing fabric. 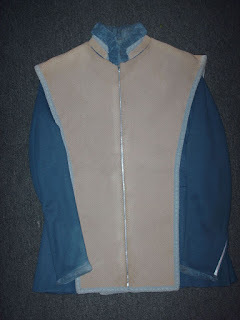 This has made the the skirt of the coat hang very limp and the body is a lot looser on the the chest. Although this doesn’t make it my best work in that regard, it’s given the coat a saggy pre-worn look I feel original had. In hide-sight there are a couple of changes I might have made to the cut, but as it is the first time I have made this coat you can’t always 100% predict how it will turn out. 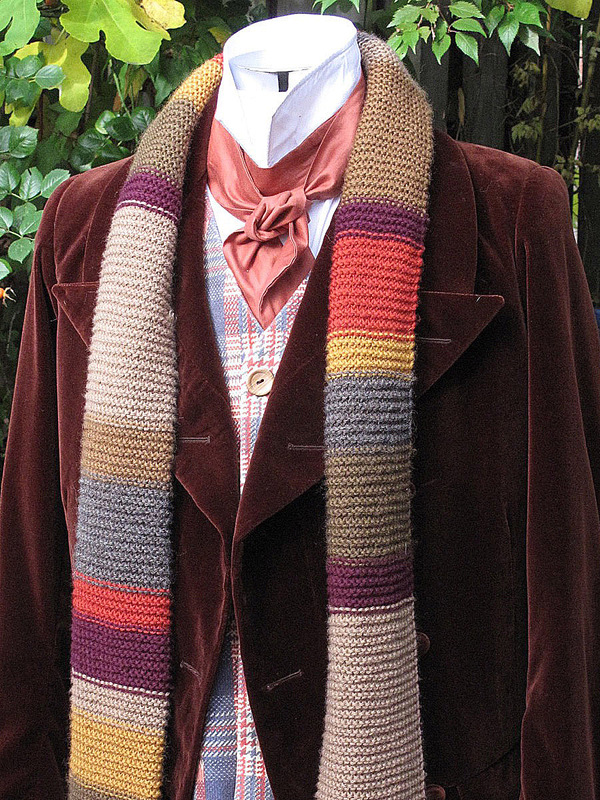 I’d love to hear what you think of the coat, as it’s taken quite a while to get to this stage! Once in a while I am client-led when it comes to what new garments I make. And here is a case in point. What follows is a bit of an insight into how I work towards making one of my replicas. 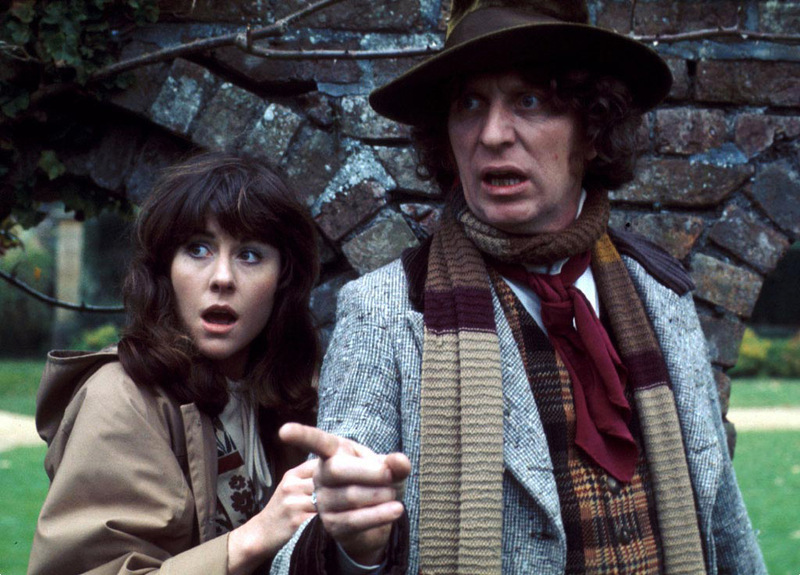 After already making one Tom Baker coat for a client - who was over the moon with the result - he asked me if I could make another for him, but one as yet I hadn’t done - the grey frock coat that debuted in season 13’s The Android Invasion. As it happened I had found sone PERFECT brown corduroy fabric a few years back, with the distinctive wide/narrow configuration. It’s quite a chestnut brown colour, but being 100% cotton it means over-dyeing it to the required dark chocolate brown will not be a problem when it comes to it. 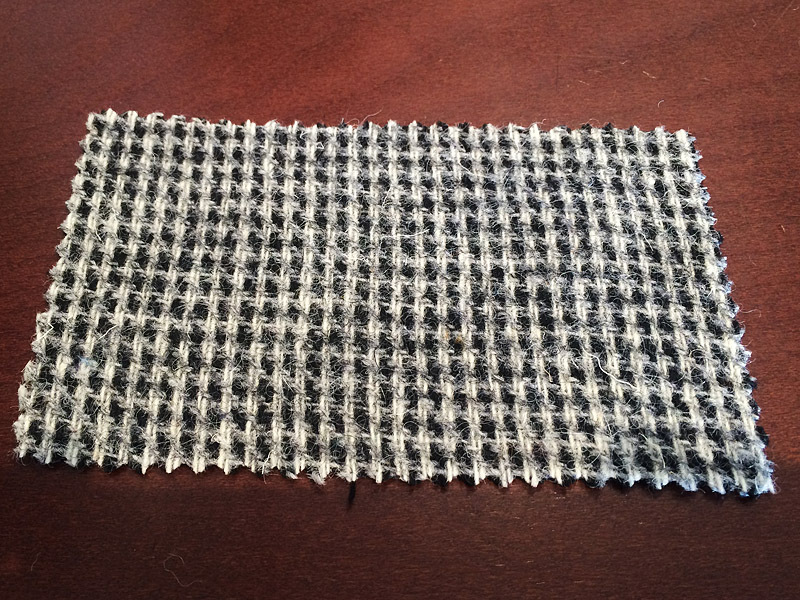 The main tweed fabric, however, is something more of a challenge. It’s been often described and mis-identified as a Donegal akin to Matt Smith’s series five jacket. This is what is known as a classic hopscotch weave - one over/one under which forms a sort of checkerboard design. But if you look closely you can see it actually is more of a vertical and horizontal grid pattern, so is a much more complex structure. 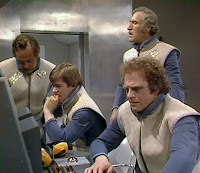 This detail rarely showed up the broadcast episodes as the definition of cameras back in the 1970s tended to mush the appearance of the coat into a single light grey colour. 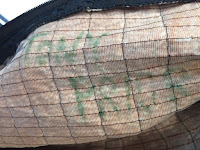 Similarly most publicity stills fail to capture this detail of the fabric. So finding a suitable cloth was going to be a problem, which in the end took months of research to track down, and endless discussions with a number of weavers with a view to recreating it from scratch. After heading down the former then latter route, I chanced upon a near identical weave in the perfect colour way freely available in a fabric supplier’s catalogue. before rushing to buying the cloth I took a swatch to mull it over. Convinced it was a good option, I first ordered one metre so I could do a drape and photography test. 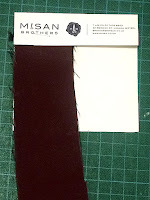 It’s all very well finding a palm-sized swatch, but how the cloth will look en-mass in a garment is a whole other thing. I think the scale of the weave is maybe a fraction large, but I am interested in how it looks at a distance, comparable with a publicity still, and to see if the weave forms an even grey colour. I felt it was a success - so finally the coat was on! 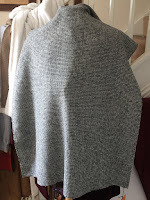 At this stage I shan’t bore you with the ins and outs of making the coat, I’m sure you want me to skip to the end and show you how it came out, so here it is! This the the coat with the whole ensemble - shirt, waistcoat, cravat and of course scarf! 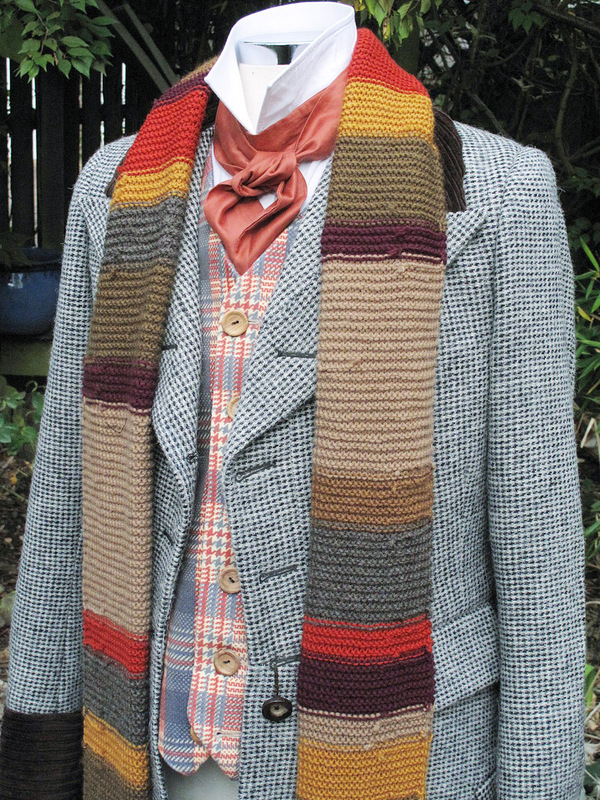 Losing the scarf so you can see more of the coat itself, here it is. And this is how the coat looks from the back. You can see how the cuffs are laid-in, with buttons aligning with the back seam, above which is the unusually sewn-in leather elbow patches. I have also faithfully as I can recreated the deceptive closure of the coat. 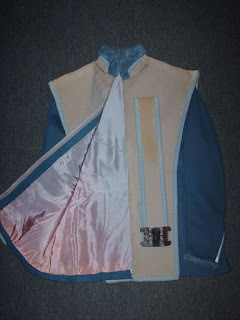 Although it has a button and buttonhole configuration for a double breasted coat, it is intended to be worn single breasted, with a toggle made from two buttons sewn together to pull the leading edges together. As far as I have been able to find, this was only ever seen once, early on in The Android Invasion. 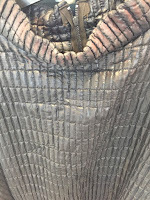 For the rest of the coats appearances, the toggle was left dangling, often from the lower from buttonhole, as you can see in this photo from Horror Of Fang Rock. 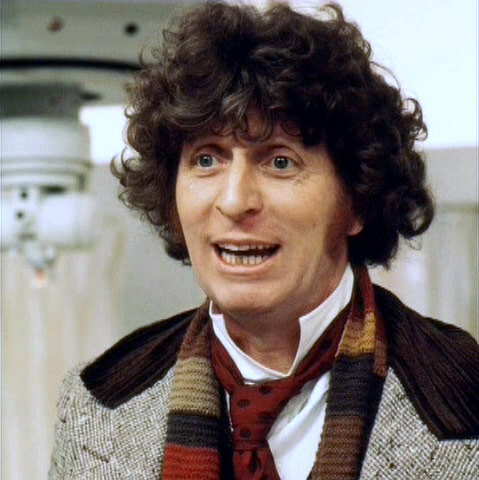 I have drawn the line though at having the missing buttons which plagued the coat’s appearances down the years! I managed to track down some buttons, which I think are a really great match to those used on the original. They were a chance find and now they are on the coat they look fab! I’d love to hear what you think of the coat, as it’s taken quite a while to get to this stage. 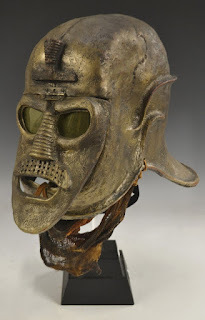 Now, this (or certainly other similar masks) have been doing the rounds since massive BBC Costume Sale in 1992! COMPLETE WITH PROVENANCE SIGNED BY JUNE HUDSON. 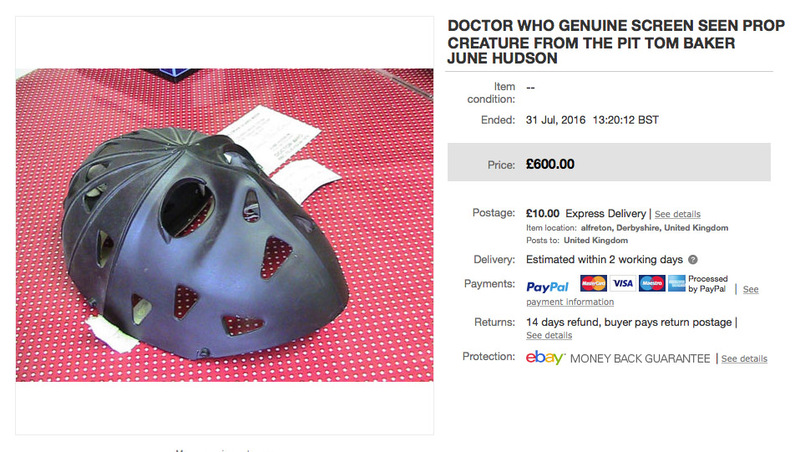 VERY DESIRABLE PIECE, PROPS FROM THE MUCH LOVED TOM BAKER ERA DONT TURN UP VERY OFTEN. For the Fourth Doctor it is all new stuff which I haven’t seen at auction before. 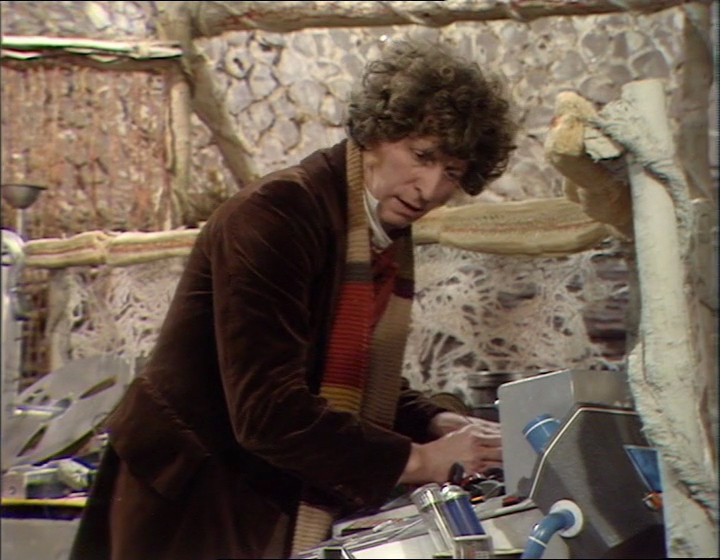 The cloak was screen used in the 1978 story 'The Invasion Of Time' and later reused in the 1989 story, 'Survival', as a Cheetah Person's horse blanket. 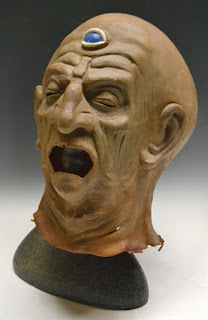 Lot 4014 - Doctor Who - a mask. It’s been a bit quiet on eBay for original Fourth Doctor items, but I did come across this one screen-used costume, and a rather amazing opportunity to buy your very own Bessie! Jacket, trousers and belt worn by the actor Graham Mallard portraying the character Harg in The Power of Kroll (1978/9), the fifth story in the Key to Time season. Harg is dragged to his death by Kroll through a pipeline at the end of Episode 2. 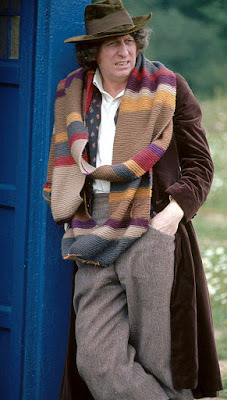 Costume purchased at auction on 3 April 1983 at the Doctor Who Celebration: 20 Years of a Time Lord in Longleat. The costume has been stored in a smoke free environment since purchase and is in overall very good condition. 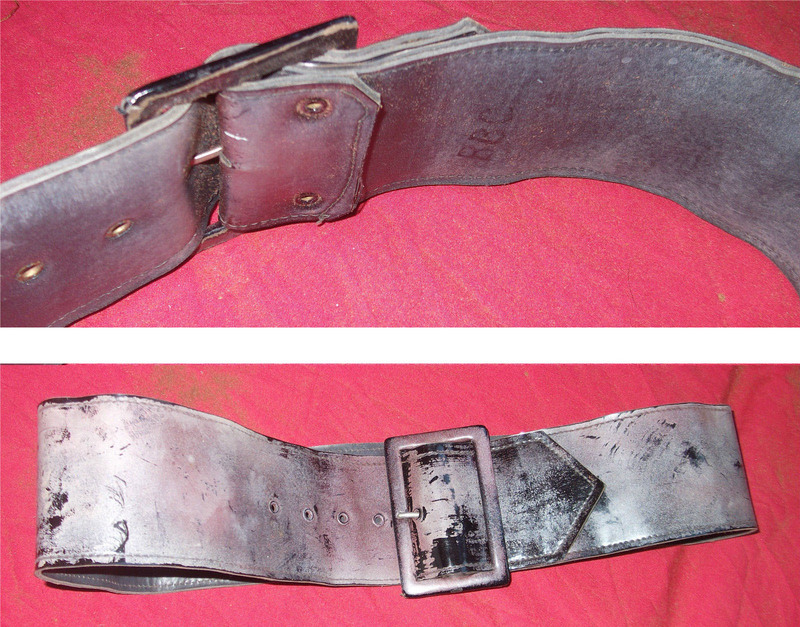 The patterned fabric has hardened and become somewhat brittle at the shoulders. 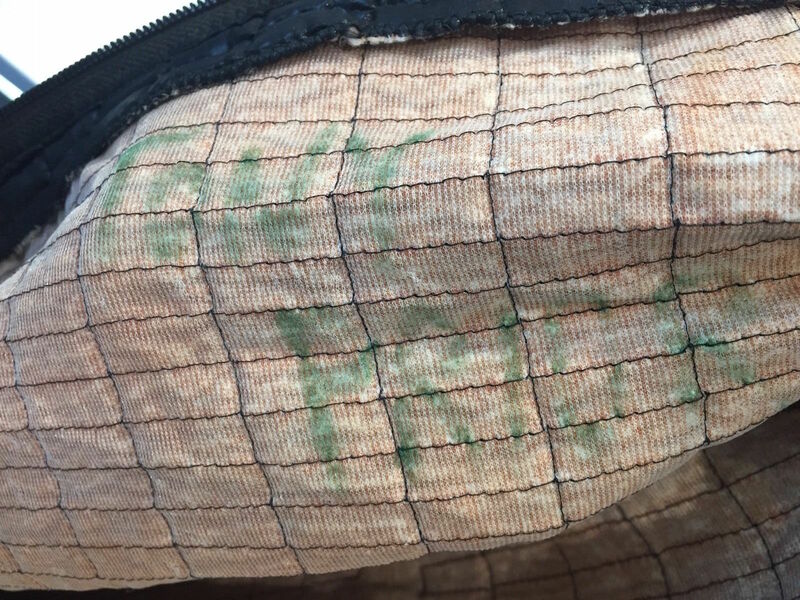 The name GRAHAM MALLARD is hand written on a tag sewn into the back of the trousers. Happy to sell internationally (can amend postage preferences from those listed as required).